This week (23 February 2016), British European Space Agency (ESA) astronaut Tim Peake shared this beautiful image of a glowing aurora from the International Space Station (ISS). Tim Peake is currently 10 weeks into a 6 month mission, living and working on the ISS. 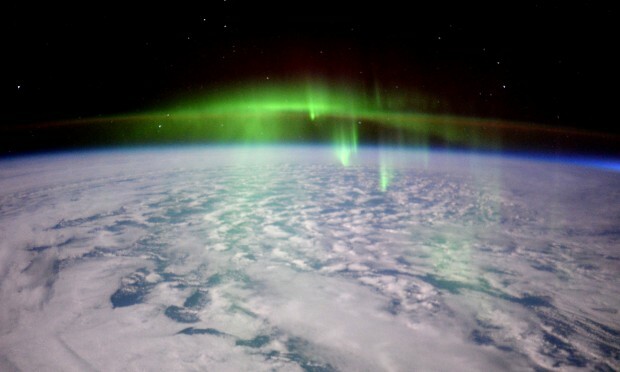 Auroras are caused by collisions between electrically charged particles released from the sun that enter the earth’s atmosphere and collide with gases such as oxygen and nitrogen. Auroras that occur in the northern hemisphere are known as ‘Aurora Borealis’ (Northern Lights), whereas those that occur in the southern hemisphere are known as ‘Aurora Australis’ (Southern Lights). The aurora is legendary many cultural groups. The Maori of New Zealand believed that the lights were reflections from torches or other campfires, whereas the Menominee Indians of Wisconsin believed that the lights indicated the location of manabai'wok (giants) who were the spirits of great hunters and fishermen. To keep up to date with all our latest posts, make sure to subscribe to our email alerts system. Alternitively, feel free to follow us on Twitter or Facebook. For more information on Tim Peake's mission, keep an eye out on the Principia UK website.